It’s either God’s Providence or just the natural course of writing extensively on the Blessed Virgin Mary for nearly 2 ½ years, but today’s “Mondays with Mary”, the 125th blog post in this series, corresponds with the Beatification of Pope Paul VI. It was his document, Mense Maio, which inspired me to begin writing these weekly posts on the Blessed Virgin Mary on May 6, 2012. To learn about the story of how “Mondays with Mary” began, I encourage you to read the very first blog post in this series. As I reflect back on the 2 ½ years and the 124 blog posts focusing on the great Theotokos, I am somewhat shocked that I have written so much on Mary, but also realize there is so much I have yet to write. There are some important Marian apparitions and titles that have yet to be written as well as not getting to the final chapter in the Second Vatican Council document, Lumen Gentium. It’s my hope in the month of November (the 50th Anniversary of the document) to write on this chapter, which focuses on Mary’s role as Maternal Mediator and Advocate. It’s also my hope that I will write more on what the Doctors of the Church have said about the Blessed Virgin. I’ve said in my posts before that it’s an exciting time to be a Catholic. Yesterday’s beatification of Pope Paul VI is yet another indication of this time. We now have three popes that served nearly one after the other in the 20th century as saints of the Catholic Church. Although Paul VI has not been officially canonized, we know that he is there in Heaven with his predecessor, Pope St. John XXIII and his successor, Pope St. John Paul II. 2. “The general norm ‘Through Mary to Jesus’ is therefore valid also for the imitation of Christ. Nevertheless, let our faith not be perturbed, as if the intervention of a creature in every way similar to us, except as regards sin, offended our personal dignity and prevented the intimacy and immediacy of our relationships of adoration and friendship with the Son of God.” – Signum Magnum, Part 2, Section 2. 4. “Whenever we say the rosary, the joyful mysteries thus place us once more before the inexpressible event [Annunciation] which is the center and summit of history: the coming on earth of Emmanuel, God with us.” – Gaudete in Domino, Section III. 6. “With Christ, she sums up in herself all joys; she lives the perfect joy promised to the Church: Mater plena sanctae laetitiae. And it is with good reason that her children on earth, turning to her, who is the mother of hope and of grace, invoke her as the cause of their joy: Causa nostrae laetitiae.” – Gaudete in Domino, Section IV. 8. [St. Augustine] said, “’…Maternal consanguinity would not have benefited Mary if she had not felt more fortunate in having Christ in her heart than in her womb.’” And it is still in her that Christians can admire the example of how to fulfill, with humility and at the same time with magnanimity, the mission which God entrusts to each one in this world, in relation to his own salvation and that of his fellow beings.” – Signum Magnum, Part 2, Section 3. So as we celebrate the beatification of Pope Paul VI, let us ask the Blessed Virgin Mary to always show us the way to Jesus Christ and to continuously lead us to closer and close to Him each day of our lives. 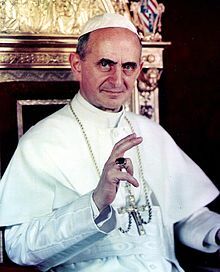 Blessed Pope Paul VI…Pray for Us. As always, please feel free to share this post or copy and paste the quotes to your social media sites in order for your family and friends to experience the beauty of the Catholic Church and her Saints. 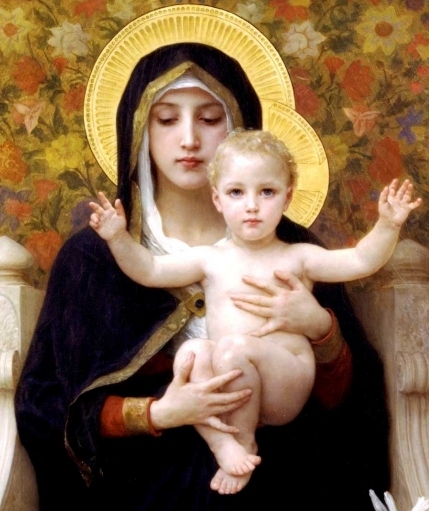 I have many times seen the beautiful image of Mary that you included in today’s entry, but have yet to learn either the name of the painting, or the artist who created it. Do you know these details? Hi Bob – I have used the image before in other posts. I too don’t know where it derives. I first saw it when I was a grad student in Theology at Franciscan. If I find out, I will contact you. A truly awe inspiring and catechetical painting. I suspect it is a detail of William Adolphe Borguereau’s “The Virgin with Angels”, or else a lead. William Adolphe Bouguereau (1825-1905), a French academic painter. You would recognize many of his paintings of our Blessed Mother.as well as some of the paintings Fr. Will has on the front of the bulletins. ( The First Mourning). Thank you for your work on Monday’s with Mary.